Although late in the year, California continues to battle devastating infernos. The state has been experiencing unrelenting, extremely dry conditions over the past several years due to fuel build-up combined with drought and a warming climate, experts say. Currently, two major blazes pose a colossal threat, already having claimed the lives of at least 44 people and decimating nearly 17,000 residences (at press time). Ignited on November 8, according to CAL FIRE, the Camp Fire is spreading throughout Butte County. Already having charred over 117,000 acres, it is only 30 percent contained. Nearly 6,500 residences are destroyed along with 260 commercial buildings, and 15,500 buildings are still at risk of fire damage. The firestorm is already the most destructive wildfire in California’s history, and the most deadly at 42 current fatalities (surpassing a 1933 Griffith Park fire in Los Angeles that led to 29 deaths), according to the Wall Street Journal. With hundreds still missing, sources expect the number of casualties to rise. The most significant loss? Nearly the entire town of Paradise in the Sierra Foothills—a community of about 27,000 residents—is gone. As firefighters make the trek back to these neighborhoods, they are reporting back to homeowners that only one house, of the 20 visited thus far, is left standing. As the fire danger in Paradise still holds—firefighters say wind gusts could reignite the blaze in areas that have not yet burned—residents searching for loved ones, pets and what is left of their homes are being turned away from the town. 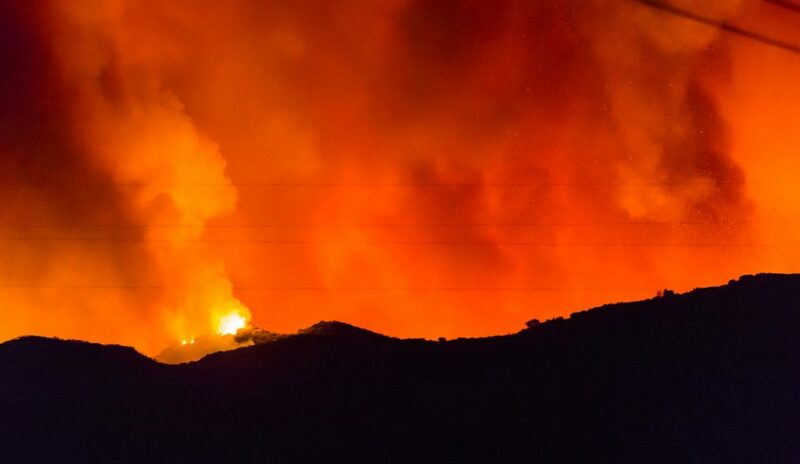 Spread throughout Los Angeles and Ventura counties in Southern California, the Woolsey Fire also ignited on November 8. Residents were still reeling from the nearby deadly Borderline bar shooting, which claimed the lives of 12 people, when evacuation orders came in. The fire has already burned through 93,662 acres and is only 30 percent contained. Over 500 structures are destroyed, while 57,000 buildings are still at risk. Nearby Hill Fire in Santa Rosa Valley also posed a threat, although it is now 85 percent contained after burning through 4,500-plus acres. These fire events are set to impact the lives of hundreds of thousands of Californians. CoreLogic predicts that 48,390 homes with a total reconstruction cost value (RCV) of about $18 billion are at high or extreme risk of wildfire damage from the Camp and Woolsey Fires. Over 200,000 people in the affected areas have been displaced by the fires—evacuations and orders to stay indoors are currently being enforced, as dense smoke poses a health risk for millions, from San Francisco all the way to San Diego. Firefighters are continuing to monitor weather conditions, expecting moderate to strong Santa Ana winds to peak through the night, which could impact extinguishing efforts. For homeowners impacted, Freddie Mac has enacted its disaster policies, which include forbearances and foreclosure suspensions, among other options. Additionally, Californians and the REALTOR® community are coming together to provide aid and relief. The California Community Foundation’s Wildfire Relief Fund has been providing aid for those impacted by wildfires for over 15 years. Additionally, Caring Choices, a nonprofit in Chico, Calif., is organizing volunteers for various duties, such as taking care of displaced animals and offering medical care, according to the New York Times. The REALTORS® Care section of the California Association of REALTORS® (C.A.R.) helps to publicize volunteer and aid opportunities throughout the state during times of need, showcasing various charities, including the C.A.R. Disaster Relief Fund, which provides grants to members of REALTOR® families who have incurred losses due to wildfires.